Fourth Grade Nothing: Rock on! I have similar memories. My daughter's godparents gave her a rocking chair and now that she is almost 15, my husband is always trying to get rid of the chair (like that one little thing is the source of all the clutter in this house.) Rest assured, that chair will leave only when my daughter someday moves out. The best thing my dad ever made me was burnt grilled cheese. He's not the handiest of men. Rocking chair seems like something hard to put together. Especially since IKEA wouldn't be around for another 8 years at least. haha. Good for your dad. That must have been very special for you. BTW...I think my neighbors had that furniture TV. Looked primo with their orange shag. Oh, and I'm strictly "A Different World" fan. Would your parents make you sit on a pillow by the tv and flip channels for them? I was the human remote control! My favourite place for watching tv was on the back of my rocking horse. My niece has that horse now. How I loved him! BAHAHAHA I remember those TV's! Those t.v's were horrible. I remember our console t.v...yuck! I had one of those totally plush chairs that kept its shape under my 35 pound body. If I sat in one now, it would never regain its shape. I never had a rocking chair and always envied kids who did! You were so cool! What I loved about those old TV's was the tubes in the back! Remember how they warmed up and glowed orange? And - when they had problems, my Dad and I would take them to the general store and test them in the tube tester thingy. We could also buy replacement tubes there! I still have the rocking chair from my childhood! Valley Stream on Long Island???? My Dad made my girls this really uncomfortable wood bear rocking chair. It is cute, but looks so uncomfortable. They love it though! My Grandmother had that exact TV when I was little. I remember having a TV similar to that. It sucked arse! I hated cleaning the wood cabinet. LOL. So funny. TV's as big as couches. Once we had one that had a stereo and turntable in it also..
this is my first time stopping by your blog and that post is hilarious!! my hubby started making me a rocking chair but it has yet to be delivered...i think it's still in pieces in the garage. I have the toy box my Dad made for me. And I still have a console TV, that works great. We had to start using it again, after our 60" got destroyed by lightning. All of our tvs were on a stand that rolled around. It was cool if I was sick, then my mom would roll it into my room. 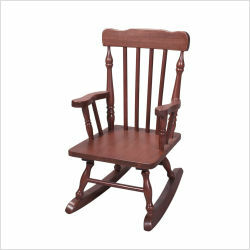 I have a wood rocking chair (adult size) that I got from my folks. They used it when I was a baby and I used it for both of my girls and now I am saving it for them. Nah sitting up close to the TV doesn't effect your eyes. If it did I'd be wearing glasses myself and... oh. That's pretty neat that your dad made you a rocking chair. My mother used to make my brother and I help make various shelves and benches from wood that lumber yards threw out because of defects. The other day I actually saw someone with one of those old TV's things. They had popped the ancient tv out and replaced it with a super high def tv. Coolest thing I have ever seen. I love TV Land! Looking into getting my son a rocking chair soon. Who doesn't love rocking? Okay, we had that TV and I definitely remember having that rocking chair back in the late 60's!! I remember our first color TV! Okay, now that everyone knows how old I am I can shut up Lol! Bahaha... I used to love my rocking chair except it wasnt "finished" so I think I may have gotten splinters from it lol!!! I have pictures from the early 80s sitting on an orange and brown geometrically patterned couch. I ask you?!! I know they bought it on the 70s, but come on! By the way! Roseanne and The Cosby Show are quite possible two of the best television shows ever! I judge the quality of a sitcom on how many times the show makes me laugh out loud, and both of those shows make me laugh hysterically on a regular basis! I love those chairs, too. Whenever I see one at a garage sale I buy it. No matter that I have only three Grands and nine chairs already. I also adore the little wicker ones! WE had one of those growing up too, and I also loved it a lot. Rocking is so comforting! !